Last Updated August 3, 2017: We've compiled a list of frequently asked questions about Pyre in case there's something you're wondering about the game. If you have additional questions you'd like answered, send us a note! Pyre is a party-based RPG from the team that brought you Bastion and Transistor! This time, we've created a party-based RPG in which you lead a band of exiles to freedom through ancient competitions spread across a vast, mystical purgatory. Who shall return to glory, and who shall remain in exile to the end of their days? Find out in our biggest-ever single-player Campaign, or challenge a friend to a fast-paced ritual showdown in Versus Mode. OK! Where can I get it? Any video showing Pyre in action? Indeed! Here is our launch trailer, and a live gameplay demo / developer Q&A. What else can you say about the game? This is the biggest and most imaginative world yet from us at Supergiant! You'll get to know an ensemble cast of characters struggling to earn back their freedom as you make your way across the forsaken land called the Downside. Characters in Pyre come in all shapes and sizes, from hulking demons grown strong from their struggle to survive, to the winged Harps, who plot against their enemies from their mountain nests. 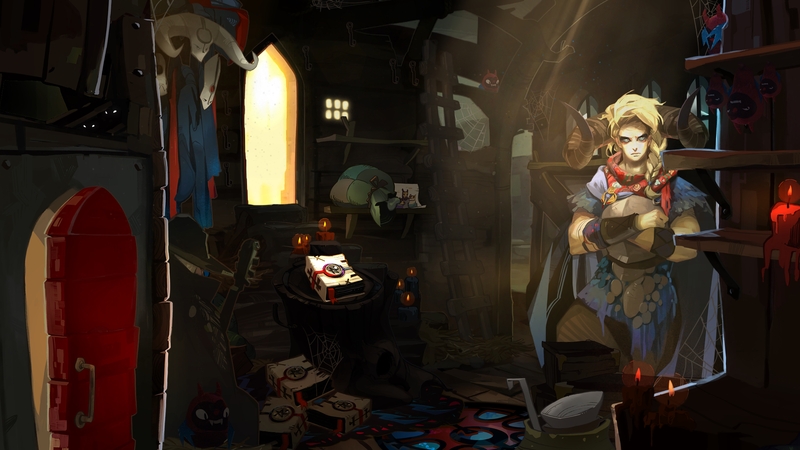 Everyone in Pyre has a unique story behind their exile, and their own reasons for wanting to return. Central to Pyre is the ancient competition called the Rites. Each Rite plays out like an intense close-quarters mystical battle, where the object is to extinguish your adversary's signal flame before they can do the same to you. You'll have to outsmart and outmaneuver your opponents to succeed -- or you can banish them outright with a powerful aura blast. You'll be up against a colorful cast of adversaries in pitched, high-stakes confrontations where each victory (or defeat!) brings your exiles closer to enlightenment. Choose three exiles from your party for each Rite, and outfit them with powerful Talismans and Masteries to gain an edge. On top of the single-player campaign, Pyre features a local two-player Versus Mode, which lets you play against a friend (or CPU opponent) in one of the game's fast-paced ritual showdowns. You'll be able to form your triumvirate from more than 20 unique characters you'll meet in the campaign, and customize your Rite in a variety of ways -- configuring your characters' abilities, choosing from a variety of stages each with their own distinct effects on gameplay, and more. We think this adds a great deal of lasting value to the game, and we've been having a great time playing it ourselves, trying out every possible character combination we can think of. Creating a specific and cohesive-feeling tone and atmosphere for our games is very important to us. From the vibrant hand-painted artwork to the evocative, reactive musical score, every aspect of Pyre's presentation is designed to draw you into its mystical fantasy world. Where can I get images and video of Pyre? Screenshots, artwork, and trailers are available on our Pyre page right here. Who is the developer and publisher of Pyre? That's us! We self-published Pyre as we did with Transistor before it. Supergiant Games started in 2009 in the living room of a house in suburban San Jose, CA. The team grew to seven people over the course of developing our first game, Bastion, which launched in 2011. Transistor, our second game, launched in 2014. Together, our games have sold close to 5 million copies across many different platforms, and earned more than 200 industry awards and accolades. All seven members of the team that created Bastion subsequently worked on Transistor, and then on Pyre. Our team grew to 12 people on Transistor, and we have stayed that size for Pyre's development. The small-team dynamic is important to how we operate. You can learn more about our team here. Is Pyre coming to other consoles / platforms? We have no plans to launch the game on other platforms at this time, as our entire focus has been on the PlayStation 4 and Steam versions. While we haven't ruled anything out for the future, bringing Pyre to different platforms is a significant undertaking for our small team so we don't take on those kinds of projects lightly, as the quality of our game is the most important thing to us. Is the game's soundtrack available? Yes! The Pyre Original Soundtrack is available for $9.99, on Steam and this web site. We also offer free streaming options on our site and YouTube channel. It packs close to two hours of original music by Supergiant's award-winning composer and audio director, Darren Korb. Featuring vocals by Darren Korb and Ashley Barrett, the album also contains bonus material and arrangements not found in the game. We also offer the soundtrack in a two-disc CD set. What are the PC / Mac / Linux system requirements? Can I play Versus Mode online, and if not, why not?! Versus Mode is designed for two players in a local, head-to-head setting, or for a single player against a computer opponent; it is not playable online. We do not have plans to introduce online play in an update -- typically, this is not something that can easily be added to a game (at least not to good results). We strongly believe that a high-quality online multiplayer experience needs to be a central focus of a game's development in order to meet today's standards. However, our main priority throughout Pyre's development was always going to be the single-player campaign experience. We felt Versus Mode provided a great bonus on top of it, whether you play against the CPU or against a friend, and chose to pursue only the local play aspect. Pyre is our team's biggest project to date; if we chased after online play in addition to everything else we were doing, the quality of the entire game would have likely suffered. Can I play Pyre cooperatively? There is no co-op mode in Pyre, due to the nature of the gameplay. There is a single-player campaign and the previously-mentioned Versus Mode for one or two players. What is 4K, and can I play Pyre in 4K?! 4K, or Ultra HD, is the commonly used term to describe an ultrahigh resolution that displays four times as many pixels onscreen as the recent standard of 1920x1080 (also known as 1080p). And, indeed, Pyre features support for 4K Ultra HD displays! Our previous games topped out at 1080p on console and PC, so this is a huge change for us. If you have a 4K display, you’ll be able to experience the artwork at an unprecedented level of sharpness and clarity. Though if you don't, we think you’ll find the game looks stunning, nonetheless! Have a look at this comparison. The top image is standard 1080p. The bottom image is 4K. Both are in-game screenshots taken from an early scene in Pyre. Pictured above is Pyre in 1080p. Click to view full-size. Now, this is Pyre in 4K! Click to expand, then click again to view actual size! For the PlayStation 4 version of the game, 4K support is built-in and should work automatically with compatible displays, if you're running the game on a PlayStation 4 Pro console. For the Steam version of the game, a 4K resolution option should show up automatically in the game settings, using compatible displays. The game should autodetect your desktop resolution when you start it. We love being able to see the work of our three talented artists Jen, Josh, and Camilo in high definition like this, and we hope you'll enjoy this aspect, too. Can I play the game in 21:9 aspect ratio? The Steam version of the game can be set to any resolution. However, the visuals are designed for 16:9 displays, and, due to the nature of the hand-painted 2D artwork featured throughout the game, they will be displayed in a letterbox format at other aspect ratios. Can I stream / make videos of the game (once it's available)? Sure, thank you for your interest! We have more details in our Let's Play policy here. What languages are supported by the game? Pyre features full text translations in simplified Chinese, Russian, French, German, and Spanish! We introduced these translations in a December 2017 content update, following what we knew would be a much bigger and more complex translation project than we've done for our previous games. 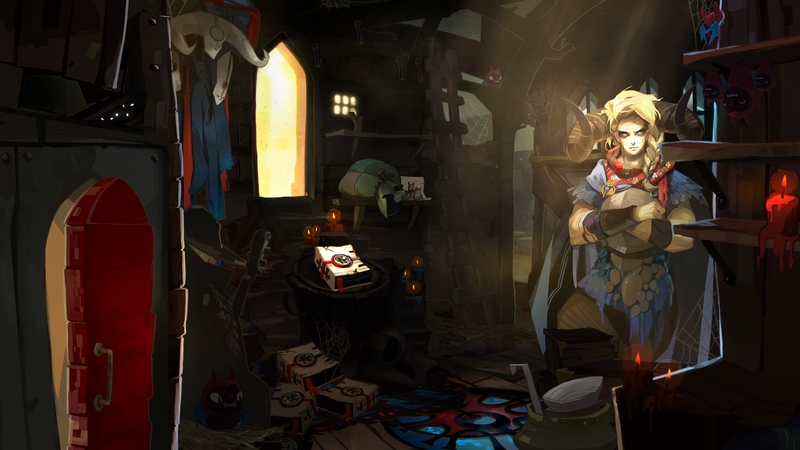 In addition to having a much larger word count than Bastion or Transistor, Pyre’s interactive narrative means there are hundreds of millions of possible content combinations in the game. We hope this update means many more players out there will be able to fully enjoy our latest adventure. Due to the nature of our games, game length tends to vary quite a bit from player to player. We don't target a specific number of hours of gameplay in our development process, but instead strive to create satisfying, complete-feeling experiences that don't overstay their welcome. In the case of Pyre, with its bigger cast of characters, the game warranted a bigger content scope to feel complete -- so, we can say that the campaign is longer than that of either Bastion or Transistor. Due to the nature of the campaign, it is highly replayable, as well. The addition of Versus Mode adds a significant amount of lasting value, too. All told, about three years, starting just a few months after the launch of Transistor. You can email them to us or ask us on Twitter!